The Denver Courthouse is at the very center of the city’s skyline, with a prominent location across a public park from Colorado’s State Capitol building. When the city government first addressed the need for more modern illumination in 2011, they chose a low-cost RGB lighting system to enhance the façade. 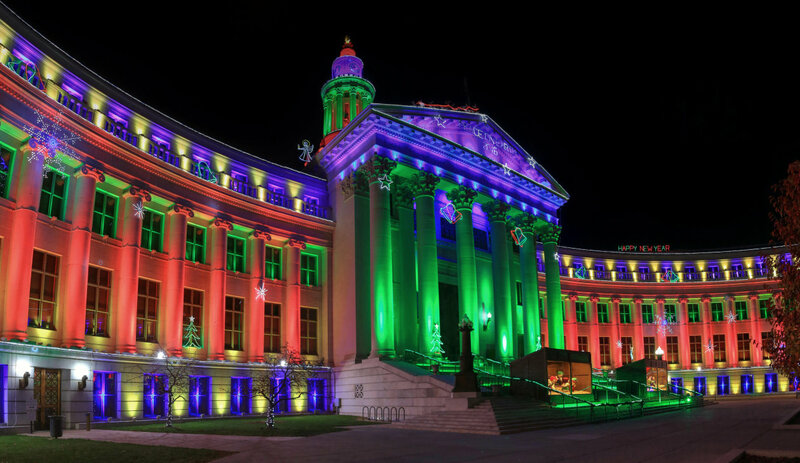 Permanently mounted fixtures on the second floor and above added a glow to events throughout the year, and the city installed additional temporary fixtures each winter to support Denver’s popular “Light the Lights” holiday event. However, after five years in the high-altitude sun, the cables and fixtures began failing at an unacceptable rate, requiring frequent downtime, maintenance and repairs. In 2016, the city called in local systems integrator Blazen Illuminations, who specified new Traxon Washer Allegro fixtures and an LCE MX control system. This new system not only stands up to Denver’s intense sunlight, but has also improved fixture optics and increased overall light levels with energy-efficient LED technology. Now Blazen’s show programmers have a better ability to pick out details on the façade, and more power to create unique, unforgettable lighting experiences. The new system proved to be an immediate hit during the city’s July 4th and NFL kickoff festivities, and provided a brilliant focal point for Downtown Denver Grand Illumination, one of the most popular lighting events in the country.